a chicago institution for generations, mario's on taylor street gets my recommendation. the great chicago equalizer... who doesn't like it? on any given summer day, a cross section of our city can be found double parked in front of it or standing in line 6 deep. it was a shock to me to realize it doesn't already have a gnr award. Here's a Marios' thread dating back to August 2004. There is another similar "peach at Mario's" thread dating from 2006, too. Last edited by JimInLoganSquare on August 16th, 2007, 5:14 pm, edited 2 times in total. sorry. i'm technologically challenged. don't know how and when i read the instructions, it doesn't register. maybe some kind soul will help me here. i see someone already has. thanks jim. Just think how sweet it will be to present them the GNR on opening day 2008, assuming they receive the award. BTW, I heartily second this nomination. Like jazzfood, I feel like it's overdue. didn't think of that. when are the awards given? i've known skip for years, he may be persuaded to be available. or yeah, may oneth when they reopen. I have to agree with the nomination of Mario's. Having read the threads listed and recalling many mentions of Mario's over the years I think Mario's is definitely deserving of a GNR. In fact if dining in the Taylor St area, a stop at Mario's afterwards is an absolute neighborhood must. i was there yesterday. killer peach, which skip told me is coming straight from a farmer that's delivering them to him, and tutti frutti that was overflowing with all sorts of fruits. it's closing on the 16th so suggest you make the time count and get it while you can. we took it to fontano's to eat w/killer tuna sub w/everything and an all italian. add the old taylor st vibe and it was perfection. we all commented on it. the unique feeling of these places in this united states of generica. characters that resist development and do it the same way for 50 yrs. skip was in good form. doesn't own a cell phone or even have a phone there, never used a computer, loves elvis, refuses to expand or allow development of his surrounding properties ie. jamba juice or starbucks... his kids very well may but that will have to wait. there's not many places i remember from early childhood, pre circle campus that are still around doing the same thing and that means as much to so many. a chicago summer sans mario's would be hard to endure or comprehend. a chicago institution beloved by all and truly one of chicago's treasures. Me too. Plus, they've had peach there now longer than the last two years combined! Superb stuff, definitely a neighborhood place. Mmmm. So glad I can walk here from work! If somebody walked by with a peach from Jewel that'd be more peach at Mario's than the last two years combined, wouldn't it? Mike G wrote: If somebody walked by with a peach from Jewel that'd be more peach at Mario's than the last two years combined, wouldn't it? No, I think they did have peach, briefly, 2 years ago. Like for one-two days. And only Cathy2 had it. Closing day for this season is Sunday September 16th. In my visit today, they said this year after many, many requests for peach. They served peach for three weeks this year. Fall sets in day after tomorrow for real. When Mario closes, then summer is really over. Stopped by this evening around 5:45 PM to find they had closed up shop for the season. Since I originally nominated it, let me be the first to mention Mario's iconic status in Chicago. Even as I'm @ this moment sick w/food poisoning and hearing the call to prayer in a very far away land, I do believe I could rally for a Mario's. The Dr. told me I could eat fruit, just not the local ice... or kebabs. Mario's, @ least in my opinion, should be a no brainer for renewal. I also hear the call to prayer from Mario's during the season. It's a no brainer for renewal! A multiple times a summer must stop for pretty much everyone I know. Strong support for GNR renewal and a good excuse to link to Jazzfood's epic Conversations with Mario . My summer season begins and ends with Mario's operating period from May 1st until mid-September. Rarely during this time does a visit to the city not include an Italian ice stop. Mario's having closed for the year just yesterday, leaves a hole in my life. I am always there for the soft opening, the evening before May 1st. If I am in the city in the evening, it is rare I don't stop by. My nieces were introduced in the last year, who now bring their friends. I enthusiastically support this renewal. What better way to spend a summer evening than visiting on the sidewalk, watermelon ice in hand, listening to Mario expound on the issues of the day? Preferable after having enjoyed a Jim's Polish, or more likely an Al's beef. 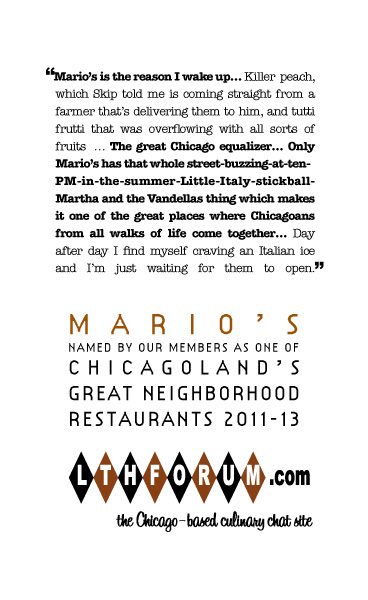 Maybe we should make Mario a Great Neighborhood Resource, and Mario's stand a Great Neighborhood Restaurant? I know politics are taboo here, but perhaps the GNR certificate could be delivered directly to City Hall, just to make sure they get the message. Yes yes yes! I'm already mourning their yearly closure. I never made it to Mario's this summer, and that bums me out. That I care enough to be bummed out by this makes me support GNR renewal. This summer I thrice had a lemon ice. Once at someplace near Boston, once at a joint in Roscoe Village, and once from Mario's. Mario's was the least lemonny and therefore least enjoyable to me. Nothing offensive about it though.